With 30 million smartphone users and a 52% Internet penetration rate, the Vietnamese market is believed by many to be fertile ground for fintech solutions and digital finance. Foreign multinationals and firms are entering the country in hopes to attract Vietnam’s young and connected population. Online and mobile payment is already the most crowded segment in Vietnam’s fintech scene but now with the entrance of tech and Internet giants like Samsung and Ant Financial, competition is getting fiercer. Samsung launched its mobile payment app Samsung Pay in September 2017 in partnership with the National Payment Corporation of Vietnam (NAPAS). Seven banks have already integrated Samsung Pay, allowing customers to use the contactless payment technology. 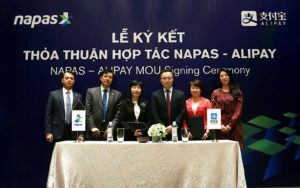 Most recently, Alibaba’s financial services arm Ant Financial, entered into a memorandum of understanding with NAPAS to enable Chinese tourists to use Alipay when travelling across Vietnam. The move is expected to boost the number of users of Alipay in next few months. Apple also plans to bring its digital wallet, Apple Pay, to Vietnam soon. “The use of new technology in card payment to enhance convenience and ensure transaction safety for card holders will help promote non-cash payment in Vietnam backed by the Government and the State Bank of Vietnam (SBV),” said Pham Tien Dung, the head of SBV’s payment department and the chairman of NAPAS. According to the Viet Nam Bankcard Association, the e-payment market in Viet Nam has great potential. With a young population and high rate of mobile phone use, e-wallet services in the country are expected to grow rapidly. In recent years, Vietnamese banks have carried out the digitalized process with different approaches. In 2017, the Military Bank (MB) established a new transaction channel on Facebook Messenger called eMBee Fanpage, the first of its kind in Vietnam. Customers only need to chat in the messaging app to make requests to the bank such as checking on account balance, money transfers or deposits, purchasing insurance products or applying for a loan. MB hopes it can have 500 new clients via Facebook. The new tool has opened new doors for digital interaction between MB and its clients. It also demonstrates a broader trend in Vietnam’s banking sector. In September 2017, the Joint Stock Commercial Bank for Investment and Development of Vietnam (BIDV) and VNPT Media Corporation signed a deal to provide integrated services between electronic payment gateway VNPT Pay and BIDV for end-customers. The services to be deployed include collection services, payment gateway services and e-wallet services. LienVietPostBank has signed a memorandum of understanding with two Japanese investors, MKI and Doreming, to implement automated solutions for human resources management and salary payments in the Vien Viet e-wallet. The Bank for Foreign Trade of Vietnam (Vietcombank) has expanded its co-operation with VietUnion to use the latter’s Payoo e-wallet service. Vietcombank has ties with several other providers and solutions including MoMo and Moca. Featured image: Samsung Pay, via Samsung.